A high energy, highly palatable cube grain concentrate for performance horses, pleasure horses, broodmares and stallions. Food-grade vegetable oil is used to increase energy content. Fortified with essential macro mineral, vitamins and trace minerals to support a strong skeletal system, stimulate the immune system and promote health. Formulated to meet and/or exceed the nutrient requirements established by the National Research Council. Formulated at a higher (12%) level of protein to support show, trail and maintenance activity. All grains used in Producer Feeds' products are screened upon receipt to remove any impurities prior to use in manufacturing. Only U.S. Number 2 corn is used by Producer Feeds â€“ damaged grain or corn screenings are not permitted in the plant. Grain products, plant protein products, processed grain byproducts, soybean oil, monocalcium phosphate, dicalcium phosphate, calcium carbonate, salt, potassium chloride, potassium sulfate, magnesium oxide, magnesium sulfate, zinc sulfate,manganese sulfate, copper sulfate, cobalt sulfate, ethylenediamine dihydriodide, vitamin A supplement, vitamin D3 supplement, vitamin E supplement. Feed at the rate of 0.5 to 1.5 pounds per 100 pounds of body weight per day. Use the table below as a guide. All Producer horse feeds should be fed with liberal quantities of good quality hay and/or pasture and free choice salt. Provide clean, fresh water at all times. Store feed in a clean, dry place protected from insects and rodents. 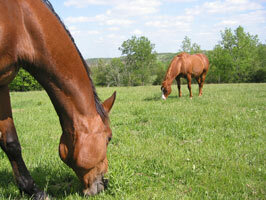 Never feed moldy or insect-infested feed to horses as it may cause illness, abortion or death.